It takes some of us much longer to figure out what our real purpose is this lifetime--and that’s okay. Says Linda, "My professional resume reads like a Wikipedia entry for Attention Deficit Disorder. I've had more jobs than hair colors and filled out more career aptitude forms than tax returns. Of course, that’s what happens when you get sidetracked from your life purpose. However, I don't regret any of it -- life lessons, like signs, are where you find them." It’s her take on spirituality that speaks to the seeker in all of us. And what do we seekers want? We want signs from God! And we want them hot and now! If we’re really honest, none of us want to reincarnate through eons of lives, without a map or some kind of navigational tools or road signs! It’s pretty tricky out there right now. Had Noah had some buoys and beacons to help him navigate the floodwaters during that yearlong search for higher ground, maybe his journey could have been six months shorter. Perhaps the length of time doing the journey doesn’t matter. Maybe what does matter is how well we do the journey, short or long. That’s where Linda’s humor is joined at the hip with her wisdom: how are we doing on this particular journey? Don’t have a clue? 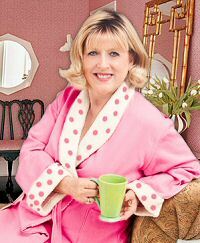 Linda’s Erma Bombeck wit drops you right into the mundane, even into an airport restroom, and voila -- the wisdom you’ve been holding your breath for shows up etched in a Q & A on the inside door of the toilet stall, and it reads: Q: "Who’s the most important person when you’re traveling? A: The person who cleans the bathroom." I’m still contemplating that profound sign. Who is Linda M. Potter? She’s a delightful human being; gracious with words and actions; kind and funny on her worst days; gifted with sharing her talents and skills, knowledge and wisdom in ways that uplift and inspire your heart and mind. Linda has a constant steady rhythm that you know you can count on when you need her. She’s the type of woman you hope you can call friend for life. 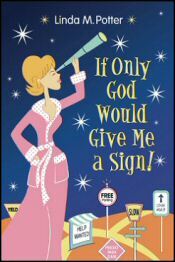 I have the great privilege of helping Linda launch her debut book: If Only God Would Give Me a Sign! Toni Holm: Can you describe the first time you were aware of "acting or performing" some little skit, song, or joke that made others laugh out loud and how did it make you feel? Linda M. Potter: In second grade my teacher put together a bulletin board featuring everyone’s baby pictures. I thought it might be fun to write cute captions for all the photos. Well, my project lead to an assembly where I read my poems as the pictures came up on the screen behind me. I wasn’t really trying to be funny, but everybody laughed and applauded. I still remember a couple of those poems. This little girl is rubbing her tummy. The cake on her face says she ate something yummy. This sad baby boy has lost his toy. When he finds it he’ll crawl for joy. Clearly, a career as a poet wasn’t in the cards but I never forgot how much fun it was to be on stage. TH: If you could do a one-act play of your life, how would you describe the set, your wardrobe, the monologue, and the audience who would come to see it? LMP: Only one act? I once wrote a one act play called, "A Box to Hide In." It was about three college roommates. One of them lived in a box in the middle of the front room. Nobody seemed to think that was odd until one day he went in and never came out. When people asked me what happened to him, I told them that Theatre of the Absurd wasn’t supposed to make sense. The truth was I didn’t really know. At times I’ve wanted to disappear. Other times I’ve wanted to be center stage. Now I just want to make sense of it all. But a play about me? I think I’d make it a musical. I love when people break into song for no apparent reason. I aspire to live my life that way. TH: They say that most comedians and humorists, say, like Erma Bombeck, use humor to camouflage the darker or tragic challenges of their lives. Has there been an event or a time in your life that was extraordinarily challenging to overcome? What tools did you use to help yourself get through that time? LMP: Everybody’s got a story. Mine reads like a soap opera. But it wasn’t a Greek tragedy. I take some comfort in that. At least on soaps, there’s always another episode, and anything is possible, e.g.. miraculous recoveries from rare diseases, coming back after decade-long absences from the story line, and the ability to turn your role over to someone else if you just get tired of the drama. But in my real, non-fiction life, probably my greatest challenge was overcoming Panic Disorder which slipped into Agoraphobia for a while. I dealt with that for over 15 years. Not losing my sense of humor played a big part in being able to finally move on. TH: Since you admit that you have applied for or worked many jobs, how has this smorgasbord of life experiences served you as a writer? LMP: Well, I certainly have no shortage of subjects to write about. But more importantly, the variety of experiences has added so much texture to my life. I think that translates into a certain amount of maturity as a writer. TH: Looking back at your own journey as a writer, what is the best advice you can give to other writers on the craft of writing, storytelling, and writing humor? LMP: Humility. My writing got so much better once I quit thinking I was hot stuff and found myself a couple of good mentors. Also honesty. If who you truly are shines through what you write, your work will ring true with readers. When people buy your book, they’re buying a piece of you as well. Make sure they get their money’s worth. TH: You are a wife, mother, grandmother, spiritual counselor, public speaker, humorist, and writer. Are there any roles you would not take on? LMP: Housekeeper. I don’t think anybody hates housekeeping more than I do. Mostly, I’m terrible about picking up after myself. There’s a metaphor in there somewhere--I feel a column coming on. TH: Are there other roles you would like to take on? LMP: When I was a kid, I always fantasized about being a movie or TV star. I’d love to do something in movies or television that allowed me to get the If Only God Would Give Me a Sign! message out to a larger audience. I’m not all that attached to the star part any more. TH: If you were to describe your spiritual path, what movie title would you give it? Who would play you? And would you be a hero, protagonist, or a main character? LMP: I actually think I’d go with my book title, If Only God Would Give Me a Sign!. However, God Only Knows! would also work. Too bad Oh, God! is already taken. I really related to John Denver’s character in that movie. I’d definitely be the protagonist -- for better or worse. I’ve always been the lead character in my own life. The buck stops here. Heroine doesn’t really work for me, although I’ve had a few heroic moments. Thank God! As to who would play me? Meryl Streep. She’s had more roles than I’ve had "careers." Her portrayals are masterful, but at the end of the day, she’s still clear about who she really is. TH: Of all the signs that have shown up, which sign gave you the most hope? The clearest insight? The most laughs? Most Laughs: Please Pick up Your Poop. It takes Please Check Baggage that one step further. No one wants to step in our ?#*!, including us. We need to clean up after ourselves before we can move on. 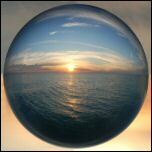 TH: You have interviewed many high profile "spiritual authors/speakers/teachers/gurus." If you could have asked them that one question that could answer all the mysteries of life, and you knew they had the right answer, what question would you have asked them? LMP: "Why?" I’d ask them "why?" I actually tell people not to ask "why"--just ask "how." All we ever need to know is "What’s the next step?" But, secretly, I’m no different than anyone else. I want to know why I’m here; why we’re all here and why things happen the way they do. If Only God Would Give Me a Sign! by Linda M. Potter will be available Spring 2011(Bibliocast, an imprint of Word Keepers, Inc.).